Starting with chapter IV. Workstation setup, previous chapters were all working towards the creation of the 'golden image' of the workstation. This goal was finally achieved in section 4. Creating the golden image in chapter VIII. Managing user profiles. Now that this 'golden image' is created, we can focus on populating the Desktop and Start Menu of individual users. In section 2. The shortcuts collection we will rearrange the collection of all shortcuts that we have collected in previous chapters. This is a one-time operation. After that we will be distributing shortcuts to individual users in section 3. Managing Desktop and Start Menu. This chapter continues with the example school that is used throughout this manual, see section 2. The Exemplum Primary School in chapter II. ServerAtSchool User Manual Overview. In this chapter the ICT coordinator (Amelia Cackle, userid 'acackl') plays an important role. assigning shortcuts to the account of her colleague Anna Maria van Schurman (userid 'aschur'). This chapter leans heavily on the previous chapters. The following assumptions should hold true. The 'golden image' has been created (see section 4. Creating the golden image in chapter VIII. Managing user profiles). The server is up and running, the workstation you are using is connected to the server. The 'golden image' has been restored on this workstation. All user accounts have been initialised on the server (see section 5. Inaugurating new user accounts in chapter VIII. Managing user profiles). The 'golden image' needs to be distributed to all workstations before these can be fully functional. Restoring the image (using the procedure documented in section 4. Restoring an image on a workstation in chapter V. Managing disk images with ghost for unix) does not depend on the contents of a user's Desktop or Start Menu. Earilier we have made backup copies of three different directory trees (see section 2.5 Keeping shortcuts in a safe place in chapter VIII. Managing user profiles). Together, these three directory trees contain all of the shortcuts that were added to the workstation during software installation. These backup copies can be found in H:\My Documents\janitors\shortcuts\all. At this moment the shortcuts are not ordered in any particular way. This makes it tedious if not difficult to construct Desktops and Start Menus for individual users. There are several ways to organise the shortcuts collection. All shortcuts could be stored in single directory. This is handy if the number of shortcuts is fairly limited. Shortcuts could be grouped together, with a single directory for every application. That is: with 30 applications installed, there are 30 directories with shortcuts. Shortcuts could be grouped together, with a single directory for every 'year' (or grade) plus additional directories for teachers and other users. Shortcuts could be organised using a combination of these strategies. NOTICE: The flexibility of ServerAtSchool allows you to choose your own strategy to organise shortcuts. However, if you choose a particular method you should stick to it. If you don't, you will quickly lose track of the shortcuts. In the previous chapter the following backups were made. The Exemplum Primary School is a small school with 7 different nests (grade12, grade3, ..., grade8) and some 16 staff members. Furthermore, the number of educational software packages is fairly limited. These considerations lead to the following strategy. All shortcuts that are relevant will be copied from the various subdirectories under H:\My Documents\janitors\shortcuts\all to a single pool in H:\My Documents\janitors\shortcuts. All shortcuts relevant to staff members wil be copied to a new directory H:\My Documents\janitors\shortcuts\staff. By organising the shortcuts this way, the Desktops for nests can be constructed by copying shortcuts from this single pool of shortcuts one by one. This is the most efficient way because each nest has a different Desktop. The Desktops of staff members are a different story. Basically all staff members will get the same shortcuts. Therefore, it makes sense to collect the shortcuts for staff members in a separate directory; this makes it easy lateron to select all shortcuts in that directory and copy them in a single pass. Note that only the relevant shortcuts need to be copied. In this context the word relevant means the shortcuts that are necessary to start a particular application, e.g. 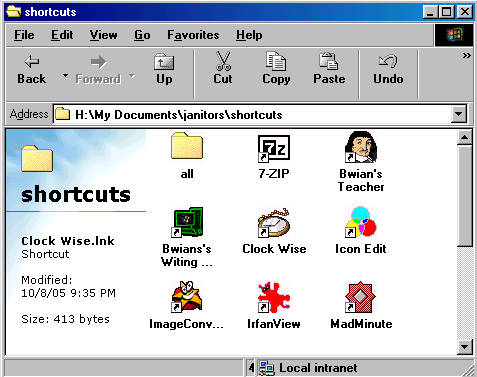 the 'MadMinute' shortcut, the 'Bwian's Witing Challenge' shortcut or the 'Bwian's Teacher' shortcut. Other shortcuts that are created as part of the software installation process often do not need to be copied. Examples are: shortcuts to ReadMe-files, links to websites and shortcuts to UnInstallers. It is handy to keep those around (under the 'all' directory tree) but they should not clutter the shortcuts collection. NOTICE: If you followed the instructions in section 3.2 Creating the profiles for the janitors in chapter VIII. Managing user profiles for your own account, you already have all shortcuts from the Desktop and the Start Menu in you own profile. If you really need to consult a ReadMe-file using the corresponding shortcut, you can do it via your own Desktop or Start Menu. Furthermore, if you did not fill your own profile with all shortcuts, the profile of the special 'scholar' account will have all shortcuts as well. If you want to copy all relevant shortcuts, you should take the following steps. If necessary (re)boot the workstation and login to the network using your own account. You, the ICT coordinator or the local systems administrator, are a member of the special 'janitors' group and therefore have access to H:\My Documents\janitors. Open H:\My Documents\janitors\shortcuts in a window by navigating to: My Documents | janitors | shortcuts. Open H:\My Documents\janitors\shortcuts\all in another window by navigating to: My Documents | janitors | shortcuts | all. Re-arrange the positions of the 'all' window and the 'shortcuts' window in such a way that you can easily access both. In the 'all' window, descend into the Desktop directory. Press and hold the [Ctrl] key. Select all the shortcuts that are relevant using the lefthand mouse button. Now drag one of the selected shortcuts to the 'shortcuts' window using the righthand mouse button. Release the righthand mouse button and select 'Copy Here'. The selected shortcuts will be copied. Now return to the 'all' window and navigate up one level. This brings you back into H:\My Documents\janitors\shortcuts\all. In the 'shortcuts' window navigate to: View | Refresh. All items in the window will now line up. At this point the 'shortcuts' window shows the 'all' directory and also all relevant shortcuts that were copied. This is illustrated in the image below. If you subsequently want to construct a subdirectory 'staff' with the shortcuts relevant to staff members you should take the following steps. Create a new directory 'staff' here. Descend into this new directory, e.g. by double-clicking it and leave the directory open. Open H:\My Documents\janitors\shortcuts again, in another window by navigating to: My Documents | janitors | shortcuts. Re-arrange the positions of the 'shortcuts' window and the 'staff' window in such a way that you can easily access both. In the 'shortcuts' window, press and hold the [Ctrl] key. Select all the shortcuts that are relevant for staff members using the lefthand mouse button. Now drag one of the selected shortcuts to the 'staff' window using the righthand mouse button. In the 'staff' window navigate to: View | Refresh. All items in the window will now line up. At this point the screen shows the two windows as illustrated below. All shortcuts are now organised. As soon as new software is installed on a workstation image, new shortcuts will be added too. It is important to keep track of those shortcuts. One way is to periodically repeat the procedure outlined in section 2.5 Keeping shortcuts in a safe place in chapter VIII. Managing user profiles. Another method is to manually copy the 'new' shortcuts to H:\My Documents\janitors\shortcuts\all and also to H:\My Documents\janitors\shortcuts and/or H:\My Documents\janitors\shortcuts\staff. Either way it is important to remember to keep a backup of the new shortcuts whenever you are installing new software. Of course the new shortcuts will be stored in the profile of the special 'scholar' account that is used to install software. However, it is good to have an extra backup. It is better to be safe than sorry. NOTICE: Note that the files in H:\My Documents\janitors\shortcuts are also backed up every hour. These backups are accessible via H:\My Backups\My Documents\janitors\shortcuts. See chapter XI. My Documents and My Backups for more information. In ServerAtSchool the shortcuts on the users' Desktops and the shortcuts (or menu items) in the users' Start Menu can be managed by those users that are a member of the predefined group 'janitors'. As a rule only the local systems administrator and the ICT coordinator are members of this group. Ordinary staff members and pupils do not have access to other users' Desktops and Start Menus. Access to the Desktops and Start Menus of all users is provided via the subdirectories H:\My Documents\janitors\Desktop and H:\My Documents\janitors\Start Menu. The remainder of this section will focus on the Desktop directory tree. The Start Menu tree works exactly the same. Access to a Desktop depends on the type of user account. The Desktop of a regular user (teachers, other staff members, etc.) is located in a subdirectory of H:\My Documents\janitors\Desktop. The name of this subdirectory is the same as the corresponding userid, i.e. the Desktop of staff member Anna Maria van Schurman, userid 'aschur', can be accessed as H:\My Documents\janitors\Desktop\aschur. The Desktops of inidividual pupils are stored in subdirectories, one per pupil. These subdirectories are grouped together per nest and these nest directories are located under the directory H:\My Documents\janitors\Desktop\nests. The Desktop of the individual pupil May Sinclair in Grade 1/2, userid 'may', can be accessed via H:\My Documents\janitors\Desktop\nests\grade12\may. The Desktop of the individual pupil Catharina Giacomo in Grade 3, userid 'catharina', can be accessed via H:\My Documents\janitors\Desktop\nests\grade3\catharina. The Desktops for the nests work the same way as those for regular users. 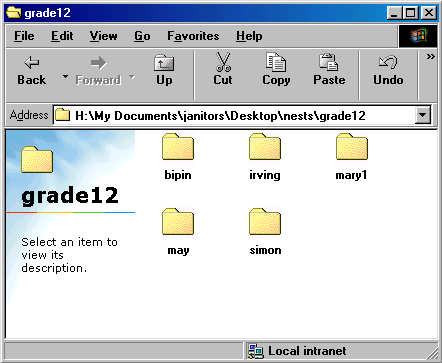 That means that the Desktop for Grade 1/2, userid 'grade12', can be accessed via H:\My Documents\janitors\Desktop\grade12. This framework is illustrated in the three images below. 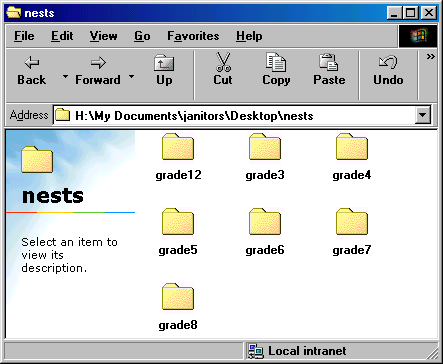 Note that there is a big difference between the directories H:\My Documents\janitors\Desktop\grade12 and H:\My Documents\janitors\Desktop\nests\grade12. 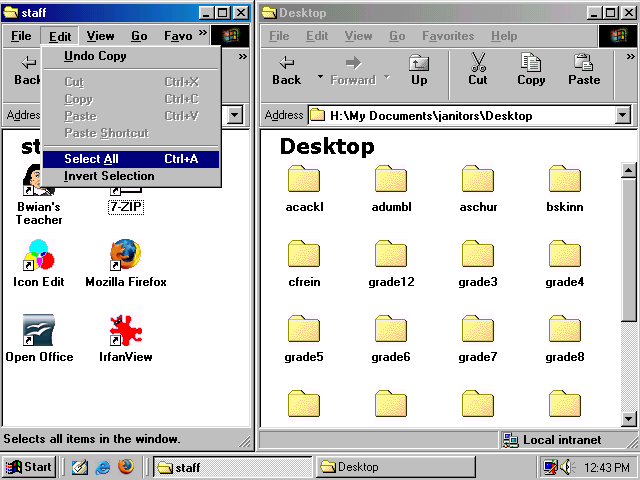 The former is the Desktop of the user account 'grade12'. The shortcuts in this directory will be visible on the Desktop when user 'grade12' logs on to the network. The latter is a container directory which holds subdirectories for the pupils in that particular nest. Shortcuts copied into this directory will not appear on any Desktop at all. Grouping the Desktops of individual pupils in these separate container directories lets you keep an overview even when there are many pupils. 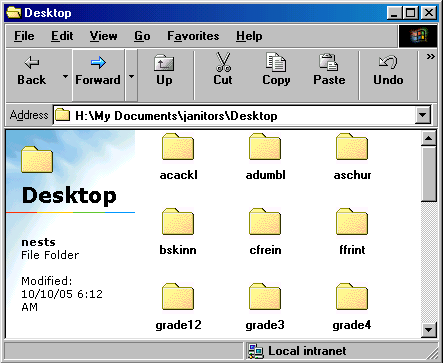 If the Desktops of individual pupils were not grouped this way, all Desktops of all users would be stored in a single directory. That would make the Desktops hard to manage. The individual Desktops such as H:\My Documents\janitors\Desktop\nests\grade12\may and H:\My Documents\janitors\Desktop\nests\grade3\catharina are used when individual pupils May Sinclair and Catharina Giacomo logon to the network using their own accounts, e.g. 'may' and 'catharina'. If the school's policy is to let all pupils in a nest use the nest account (e.g. 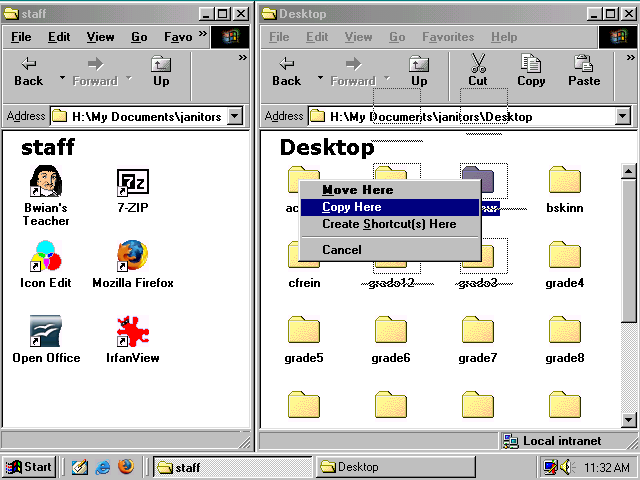 'grade12' or 'grade3') then the individual Desktops are never used. Note that it is also possible to combine these strategies. The general school policy could be to have all pupils use the nest account except that one pupil in grade 3, say Herbert Spencer, who requires special attention and therefore logs on to the network using his personal account 'herbert' rather than the nest account 'grade3'. Herbert could have his own personal Desktop (stored in H:\My Documents\janitors\Desktop\nests\grade3\hertbert) with additional shortcuts to remedial software and also have his own personal profile (the USER.DAT file) in which extra-large screen fonts are configured. The directory structure of the Desktop directory at the Exemplum Primary School is illustrated below. The directories that represent an actual Desktop, i.e. that contain shortcuts, are emphasised. NOTICE: After pupils are promoted to the next grade at the end of the schoolyear, their individual Desktops are also moved to the next grade. That is, next year May Sinclair's Desktop can be accessed via H:\My Documents\janitors\Desktop\nests\grade3\may and the Desktop of Catharina Giacomo via H:\My Documents\janitors\Desktop\nests\grade4\catharina. Before shortcuts can be assigned to the Desktop (or the Start Menu) of a user, the corresponding account has to be inaugurated. That is, the user must have logged on to the network successfully at least once. Obviously, this requires a valid account and an SMB password. Creating a completely new and fully functional user account requires three different steps. The new user account needs to be created with Janitor. Different methods can be used to create a user account, e.g. via the web-based interface, via the command line or perhaps by uploading a file. The new account should at least have a valid SMB password or the special password NO PASSWORD which grants access to Windows Networking without a password. See section 5. Managing users in chapter III. Janitor for more information. After the account is created with Janitor, the personal profile for the account needs to be established. The easiest way to do this is to use the account to logon to the network once. See section 5. Inaugurating new user accounts in chapter VIII. Managing user profiles for more information. 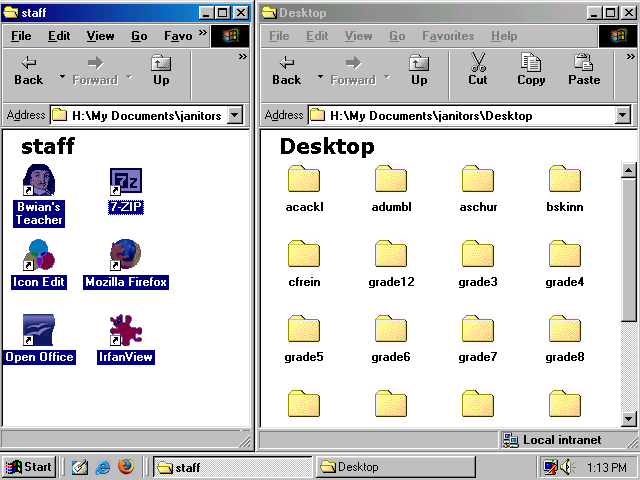 After the account is inaugurated in the previous step, the default Desktop and Start Menu are completely empty. The Desktop and Start Menu can be populated by copying the necessary shortcuts to the user's Desktop and Start Menu directory. See section 3.3 Adding shortcuts to a Desktop below. NOTICE: If the account is not locked, the user should not be logged in while the shortcuts are being assigned to the Desktop and the Start Menu. This is due to the fact that the 'empty' Desktop (or Start Menu) that exists at the time of the first logon will be retained after logging off, even if the Desktop (or Start Menu) was filled with all kinds of shortcuts before logging off. If the account is locked, there should be no adverse effects. However, in order to keep things as straightforward as possible, it is best to remember that the user should not be logged in while you are adding or deleting shortcuts for this account. See section 5.2 Locking user profiles in chapter VIII. Managing user profiles for more intormation about locking accounts. A shortcut can be added to the Desktop of a user by copying a shortcut from your collection (see section 2. The shortcuts collection above) to the directory that corresponds to that user's Desktop. The process is illustrated, in great detail, in the images below. The goal in this example is to assign all shortcuts that were collected for staff members (in H:\My Documents\janitors\shortcuts\staff) to the Desktop of the staff member Anna van Schurman (userid 'aschur'). If you want to assign the shortcuts, you should take the following steps. 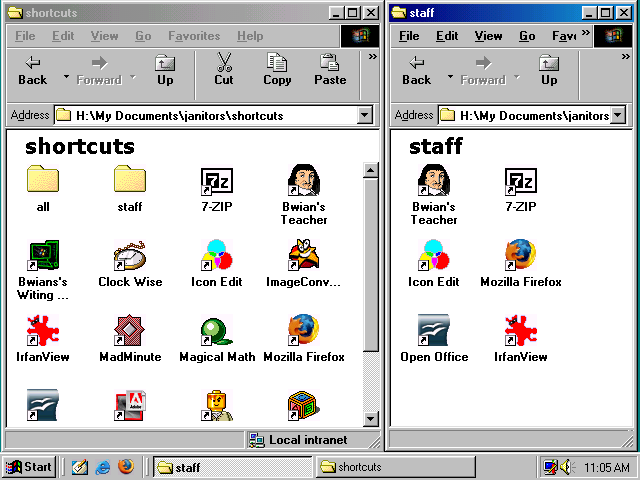 Open H:\My Documents\janitors\shortcuts\staff in a window by navigating to: My Documents | janitors | shortcuts | staff. Open H:\My Documents\janitors\Desktop in another window by navigating to: My Documents | janitors | Destop. Re-arrange the positions of the 'staff' window and the 'shortcuts' window in such a way that you can easily access both. The screen now looks like the image below. Note that the window at the left hand side contains the shortcuts that were carefully collected when organising all shortcuts. The window at the right hand side shows the directories of all regular users. These directories correspond with the Desktops of these users. Select all the shortcuts in the 'staff' window, e.g. by navigating to: Edit | Select All in the window's menu as illustrated below. Alternatively you could press [Ctrl-A] to select all shortcuts in the staff directory. Either way the items will be selected, indicated by the darkblue colour in the image below. Drag the selected shortcuts from the window at the left hand side to the window at the right hand side as follows. Click on one of the selected shortcuts using the right hand mouse button (e.g. the 'Mozilla Firefox' shortcut). Do not yet release the mouse button. Move the mouse to the other window. 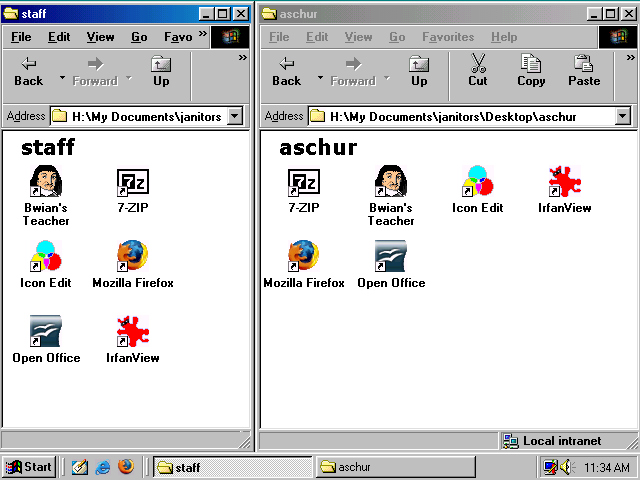 Make sure that the mouse cursor points at the directory called 'aschur'. Release the right hand mouse button. A popup menu like the one in the image below appears. In the popup menu, select the option 'Copy Here' as illustrated in the image below. Do not choose the option to move the shortcut. If you would do that, the selected shortcuts would disappear from your carefully collected set of shortcuts. After selecting the option 'Copy Here', all the shortcuts that were selected are copied to the directory 'aschur'. The shortcuts will appear on the Desktop after 'aschur' logs on to the network. If you want to verify that the shortcuts are indeed copied, you could descend into the directory 'aschur', e.g. by double-clicking it and checking the contents. This is illustrated below. NOTICE: Bear in mind that the user should not be logged in while the shortcuts are assigned. The changes you make to the Desktop would be undone after the user logs out. This is due to the fact that the user profile on the server, including the shortcuts from Desktop and Start Menu, is synchronised with the copy of the profile (and Desktop and Start Menu) as it exists on the workstation at the moment the user logs off. When distributing shortcuts en masse, please make sure no users or nests are logged in on any workstation in school. Check if all workstations are switched off and you did not overlook one where accidentally someone was still loggged on. Perhaps the best time to do this is after school's out. Removing shortcuts is accomplished by deleting them from a user's Desktop. If you want to remove a shortcut from the Desktop of a user, say 'aschur', you should take the following steps. If necessary (re)boot the workstation and login to the network using your own account. You, the ICT coordinator or the local systems administrator, are a member of the special 'janitors' group and therefore have access to users' Desktops via H:\My Documents\janitors\Desktop. 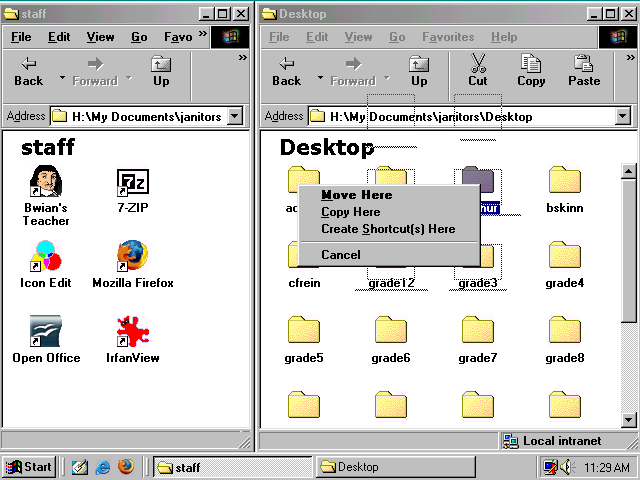 Open H:\My Documents\janitors\shortcuts\Desktop by navigating to: My Documents | janitors | shortcuts | Desktop. Descend into the directory that corresponds to the user whose Desktop shortcuts you want to delete, e.g. by double-clicking on the directory 'aschur'. Select the shortcut you wish to delete by clicking on it once. Hit the [Del] key. The 'Confirm File Delete' dialogue appears. Press [Yes] to confirm the deletion. The shortcut will be deleted. Note that there are many ways to delete shortcuts, e.g. rightclicking on the shortcut and selecting 'Delete' from the popup menu. NOTICE: Bear in mind that the user should not be logged in while the shortcuts are deleted. The changes you make to the Desktop would be undone after the user logs out. This is due to the fact that the user profile on the server, including the shortcuts from Desktop and Start Menu, is synchronised with the copy of the profile (and Desktop and Start Menu) as it exists on the workstation at the moment the user logs off. In ServerAtSchool the Start Menu is not used. All programs can be accessed via shortcuts placed on the user's Desktop. However, if you want to distribute Start Menu items to individual users and nests, you can use the same procedure as described in section 3.3 Adding shortcuts to a Desktop above. If you want to assign the shortcuts, you should take the following steps. Open H:\My Documents\janitors\Start Menu in another window by navigating to: My Documents | janitors | Start Menu. Descend into the user's directory, e.g. by double clicking on it. Optionally you may want to further descend into the subdirectory 'Programs'. Re-arrange the positions of the 'shortcuts' window and the 'start menu' window in such a way that you can easily access both. Select all the shortcut you wish to assign in the 'shortcuts' window. Drag the selected shortcut from the 'shortcuts' window to the 'start menu' window as follows. Click on one of the selected shortcut using the right hand mouse button. Do not yet release the mouse button. Move the mouse to the other window. In the popup menu, select the option 'Copy Here'. The shortcut will be copied. Note that you should not choose to move the shortcut because if you would do that, the selected shortcut would disappear from your carefully collected set of shortcuts. NOTICE: Bear in mind that the user should not be logged in while the shortcuts are assigned. The changes you make to the Start Menu would be undone after the user logs out. This is due to the fact that the user profile on the server, including the shortcuts from Desktop and Start Menu, is synchronised with the copy of the profile (and Desktop and Start Menu) as it exists on the workstation at the moment the user logs off. NOTICE: It is customary to place shortcuts in the standard 'Programs' subdirectory of the Start Menu. If you place shortcuts in the 'Start Menu' itself, they are added at the top of the popup menu that appears when the [Start] button is pressed. If you add more than a few items this menu becomes very crowded. There is a special subdirectory in the Programs subdirectory of the Start Menu of every user. This special subdirectory is called StartUp. Any shortcuts that are placed in this special subdirectory are executed automatically, i.e. without user intervention, whenever the user logs on to the network. If you want to start a program automatically every time a user, say user 'aschur', logs on to the network, you should take the following steps. If necessary (re)boot the workstation and login to the network using your own account. You, the ICT coordinator or the local systems administrator, are a member of the special 'janitors' group and therefore have access to the user's Start Menu via H:\My Documents\janitors\Start Menu. Open H:\My Documents\janitors\shortcuts\Start Menu\aschur\Programs\StartUp in another window. Select all the shortcut you wish to start automatically in the 'shortcuts' window. Drag the selected shortcut from the 'shortcuts' window to the 'startup' window as follows. When the user 'aschur' logs on to the network, the shortcut in this 'StartUp' directory will automatically be executed. A possible application for such an 'automatic' shortcut would be to load an office program (word processor, spreadsheet, etc.). Another application could be to start a browser with a URL pointing to the latest news.